كليربست كبسولات مضادة للهيستامين / مزيلة للإحتقان طويلة المفعول لا تسبب النعاس للتخلص السريع من حساسية وإحتقان الأنف والجيوب الأنفية و أعراض نزلات البرد. يحتوي مستحضر كليريست على تركيبة متميزة من مادتين فعالتين، هما مضاد للهيستامين و مزيل للإحتقان. - سیتریزین: مضاد قوي للهيستامين، ممتد المفعول ولا يسبب النعاس . سودوافدرين: مادة معروفة بتأثيرها المضاد للإحتقان لإزالة إحتقان الأنف والجيوب الأنفية. و الزكام. * حكة الأنف. في حالات نادرة قد تحدث بعض الأعراض الخفيفة مثل إضطرابات في الجهاز الهضمي، صداع، زيادة في ضربات القلب و العصبية. * الأطفال الأقل من ۱۲ سنة. * الحساسية لأي من مكونات المستحضر. * المرضي اللذين يعانون من إرتفاع شديد في التصر ضغط الدم. * المرضي اللذين يعانون من قصور شديد بالشرايين التاجية. شرائط يحتوي كل شريط على 7 كبسولات . يحفظ في درجة حرارة أقل من ۳۰م. 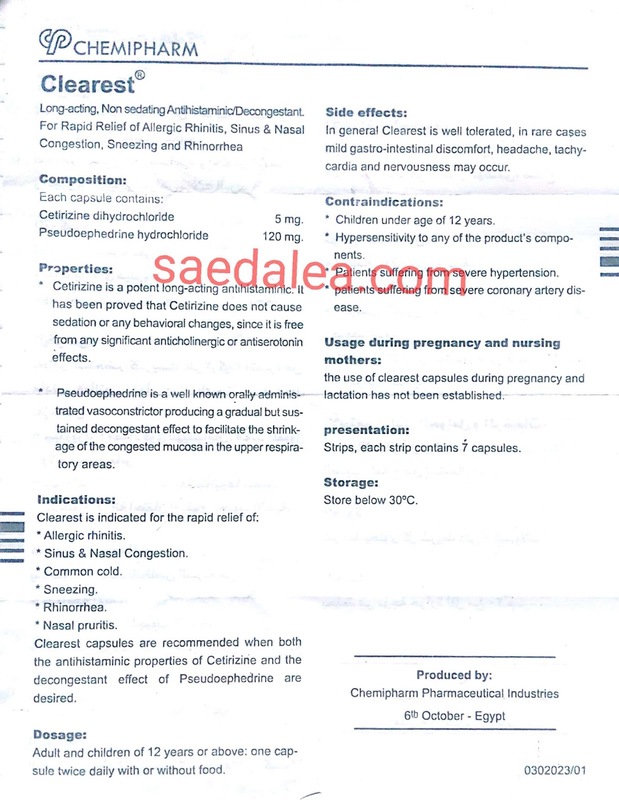 Cetirizine is a potent long-acting antihistaminic. It has been proved that Cetirizine does not cause sedation or any behavioral changes, since it is free from any significant anticholinergic or antiserotonin effects. Pseudoephedrine is a well known orally administrated vasoconstrictor producing a gradual but sustained decongestant effect to facilitate the shrinkage of the congested mucosa in the upper respiratory areas. Indications: Clearest is indicated for the rapid relief of: * Allergic rhinitis. * Sinus & Nasal Congestion. * Common cold. * Sneezing. * Rhinorrhea. * Nasal pruritis. 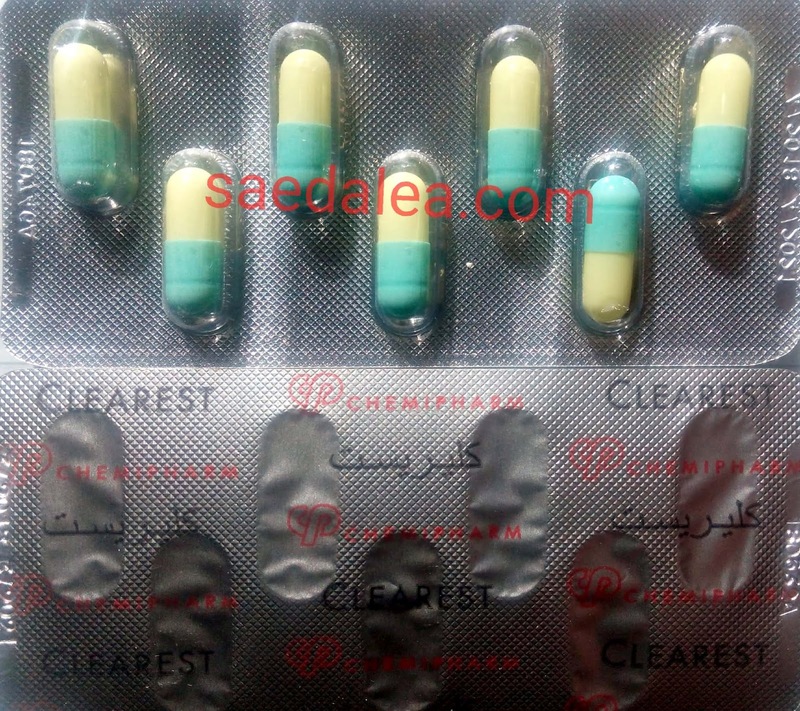 Clearest capsules are recommended when both the antihistaminic properties of Cetirizine and the decongestant effect of Pseudoephedrine are desired. Dosage: Adult and children of 12 years or above: one capsule twice daily with or without food. Side effects: in general Clearest is well tolerated, in rare cases mild gastro-intestinal discomfort, headache, tachycardia and nervousness may occur. Usage during pregnancy and nursing mothers: the use of clearest capsules during pregnancy and lactation has not been established. presentation: Strips, each strip contains 1 capsules.